On August 22, 2017, Bloomsburg University upgraded our television service that we provide to our campus community. With this upgrade, students will now have 90+ channels to choose from including high-definition and premium channels (HBO and Cinemax). In 2018, we added additional viewing options for all on-campus residents, providing students with have access to HBO GO® and MAX GO® as well as Stream2 IP Television included in with their campus television service. We've also implemented the Campus Life Channel which provides the University community with information about current campus events, social media posts, news, weather and more. In order to receive channels via the University provided television service, a television must contain a QAM (quadrature amplitude modulation) digital tuner. Since 2006, most major television manufacturers have installed QAM digital tuners in their products. However, some budget televisions and manufacturers may still not have this capability. Some TVs that have shown the incompatibility include certain models manufactured by Sansui, Seiki, and Orion as these televisions do not receive some or all available channels. Please check to make sure your television is compatible with our campus service. If your television does not support a QAM tuner, you have the option to purchase a digital conversion box. Like a TV, you must make sure that the conversion box includes a QAM tuner such as the PICO HD-2 or PICO VMX1-1*. 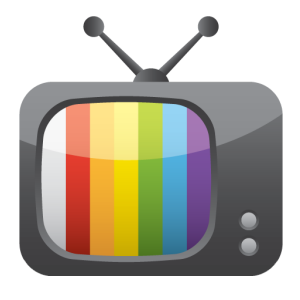 After you connect your television to the campus service, please make sure to run the auto program feature to ensure your television receives all available channels. 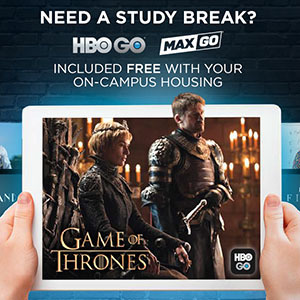 All currently enrolled students residing in on-campus housing have access to HBO GO® and MAX GO®, giving residents instant, unlimited access to HBO® and Cinemax® programming anytime, anywhere at no extra charge. Visit HBOGO.com or MAXGO.com or download the app to your mobile device. Click "Sign In" and select "Bloomsburg University of PA" from the dropdown menu. Follow the prompts and enter your HuskyID and password you use on campus. Notice: HBO GO® and MAX GO® are available anytime, anywhere — on or off campus. Game consoles and connected TV devices can only be used on the campus network. A new television experience is here. You now have the ability to watch live TV and sports on your computer, tablet and phone via the Stream2 IP Television service. Download the Stream2 app to your mobile device from your app store. Log into the app using the MyCampusVideo username and password you created.